Evidence of monitoring of violent events associated with products produced by the company. Efforts underway to research and produce safer guns and gun products. Assessment of the corporate reputational and financial risks related to gun violence in the U.S."
The resolution won 69% of the shareholder vote! This is terrific. It is in line with other corporate resistance to gun violence by Citigroup and Bank of America. According to The New York Times, Citigroup forbids "any new retail clients who operate gun shops to sell guns to people who have not passed background checks" and "restricts those shops from selling firearms to people younger than 21 and bars sales of bump stocks and high-capacity magazines"; Bank of America refuses loans to "manufacturers of military-inspired firearms that civilians can use." The Times also wondered publicly if anyone was going to purchase Remington Outdoor as it emerges from bankruptcy. 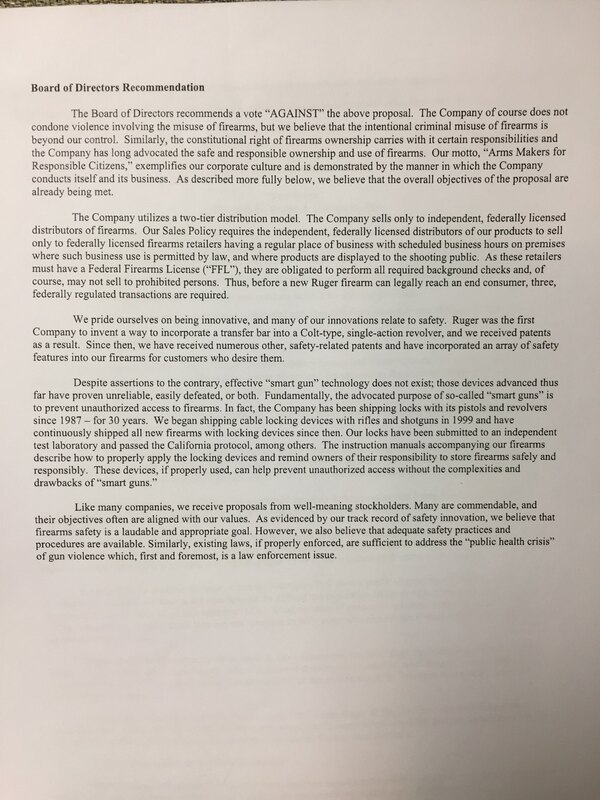 What a wonderful array of women standing together, calling for a report that the one female and eight male members of the Sturm, Ruger & Co. board of directors called on the shareholders to reject. But 69% disregarded the advice of their directors. A Jewish friend who organized a shareholder campaign years ago against Nestle always marveled that anyone could vote against the Daughters of Charity or the Sisters of the Holy Names of Jesus and Mary – which is probably why companies generally don't print the whole list. Religious sisters have been calling out corporations for a while. My community, Loretto, began reviewing our investment portfolio around 1968. In 1970 Sr. Mary Luke Tobin (who had served as president of LCWR in the '60s and president of Loretto from 1958 to 1970) attended a Honeywell shareholders meeting as a protesting stockholder. I attended Monsanto meetings with a woman from the Church of the Brethren, calling for an end to management of a nuclear weapons site in Ohio. My new friend Velma had not known sisters, but of course every Monsanto employee ushered us in, calling us "sister." Velma liked it a lot. Shareholder resolutions are limited to 500 words, must be submitted by a deadline set by the company, and must be presented by the proponent in person at the annual meeting. The filer must own significant shares – I think $2,000 worth of stock, these days. And most important, the resolution must deal with extraordinary business, not the ordinary business of the day. For example, one year in the 1990s, several members of Interfaith Center on Corporate Responsibility filed a resolution with General Dynamics asking the company to reveal to its employees a list of toxic materials used in the workplace. The Securities and Exchange Commission ruled that shareholders could not direct company management to share this information with its workforce because that is ordinary business. The next year the resolution asked instead that the list of toxic materials be shared with the shareholders. The SEC agreed that this was an appropriate request and would shed light on corporate behavior. Alas, the resolution lost. As I recollect, it did not garner even 3 percent of the vote, the threshold for resubmitting a resolution the second year. This is the background I brought to a recent article, "Why It's So Hard to Invest with a Social Conscience." The article is worth reading if you own stock, and you would like to be a more responsible owner of the business. Yes, a company might have enlightened labor policy but also lead the list in foreign arms sales — or have active environmental court cases — or any other contradiction-in-terms to social conscience. But the lesson the sisters teach is, "Read those shareholder resolutions, vote your proxy, and support the challenges to business as usual."